Margaret & Kristoph Celtic Duo is located in Oakland, CA. Since 1993, they have been performing their original arrangements of Celtic music from the British Isles and the Medieval and Renaissance melodies of the European castles, and countrysides. Their sound features tight vocal and instrumental harmonies plus the lyrical music of the Celtic harp, octave mandolin, 6 and 12-string guitars, flute, and recorders. 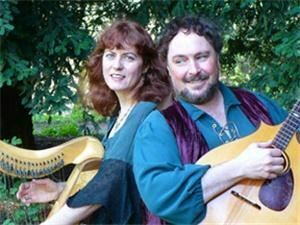 Through their travels and studies, Margaret & Kristoph have put together an engaging collection of traditional Celtic, Medieval, and Renaissance music ranging from lovely harp tunes to danceable Irish jigs and reels to ballads and singalong songs. Margaret & Kristoph have performed extensively throughout the San Francisco Bay Area at events, concert halls, and festivals including Herbst Theatre, Grace Cathedral, Freight & Salvage, the Walnut Creek and Mill Valley Art & Wine Festivals, the Redwood Mountain Fair, and the Health & Harmony Festival. They have performed in Britain and Germany and for hundreds of weddings and private events. They can be heard on dozens of recordings, of the duo and with their bands Avalon Rising and Broceliande, and in 2008 they performed in the Disney movie Bedtime Stories.